Widely recognised as the most remarkable and high quality example of a municipal public baths. Built 1903-06 of brick and terracotta, it is very much a building of its period, with strong art nouveau influences apparent throughout, particularly in the decorative finishes. There are over 100 stained glass windows, with sixteen of these being of particular interest, depicting sportsmen, rural scenes and a variety of symbolic motifs. 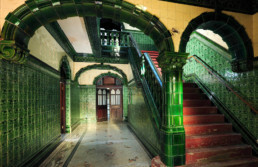 Key public spaces have floor to ceiling tiling made by the Pilkington Tile Company and the Males 1st Class entrance hall has a mosaic floor and an ornate ceramic stair balustrade. 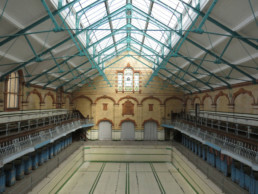 Partially restored and open as a heritage visitor attraction and events venue, there are three empty swimming pools (one of which is floored over), a Turkish Baths suite and many ancillary spaces. Open for guided tours, Open Days and other public events. Available for private hire for photoshoots, film location work, weddings and other private events. 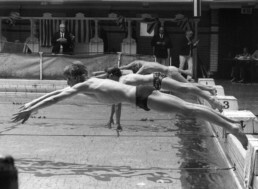 Victoria Baths has three entrances, and had three pools: Males 1st Class, Males 2nd Class and Females. This tells the present day visitor the normal pattern of gender and class segregation in swimming and bathing in the Victorian and Edwardian era. Although City architect Henry Price was responsible for overseeing the construction of the building, he didn’t actually design it. The original architect/designer is uncertain. 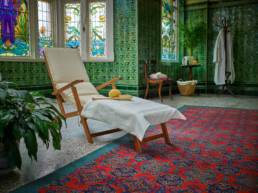 Victoria Baths has the first Aeratone to be installed in a public baths in England, dating from 1952. This is a bit like a Jacuzzi but much more powerful. 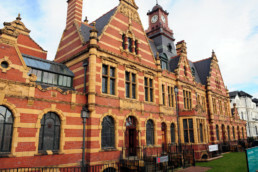 Victoria Baths won the first series of BBC TWO’s Restoration programme in 2003. Restoration to date has concentrated on vital external repairs. The long term vision is to fully restore the building, bringing public leisure facilities back into use. The Trust has partnered with Fusion Lifestyle to progress the next phase: – Phase 2 will see the re-opening of the Turkish Baths suite, the creation of a modern health suite of treatment rooms and the conversion of the extensive Superintendent’s Flat into residential accommodation. This is a £4.5m project; the Trust are fundraising to raise this figure including an application to Heritage Lottery Fund.